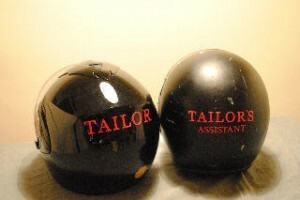 Bespoke Helmets & Bespoke Suits! A little extra accessory we have added to the Henry Herbert scootering service. We have marked all of the helmets with luminous wording describing what we do. The lettering was done by the super friendly and very professional Neon & Sighmakers in east London. Our professional bespoke suits deliverers and tailors assistants will surely hit the streets with finesse. See also: Bespoke Tailor, Bespoke Tailoring, bespoke tailors, east London, Henry Herbert, Savile Row, Savile Row Suits, scootering, service, suit, Visiting Tailor Service, wedding, Wedding Suit, wording. Bespoke Helmets & Bespoke Suits! - Henry Herbert Tailors.